Red Hat OpenShift is a comprehensive enterprise-grade application platform built for containers powered by Kubernetes. OpenShift lets developers quickly build, develop, and deploy applications on nearly any infrastructure, public or private. It offers enterprises full control over their Kubernetes environments, whether they’re on-premise or in the public cloud, giving teams freedom to build and run applications anywhere. Portworx recently achieved Red Hat certification for Red Hat OpenShift Container Platform and PX-Enterprise is available in the Red Hat Container Catalog. This certification enables enterprises to confidently run high-performance stateful applications like databases, big and fast data workloads, and machine learning applications on the Red Hat OpenShift Container Platform. Learn more about Portworx & OpenShift in our Product Brief. A common question that we are asked by our OpenShift users is how do I backup and recover a database on OpenShift? 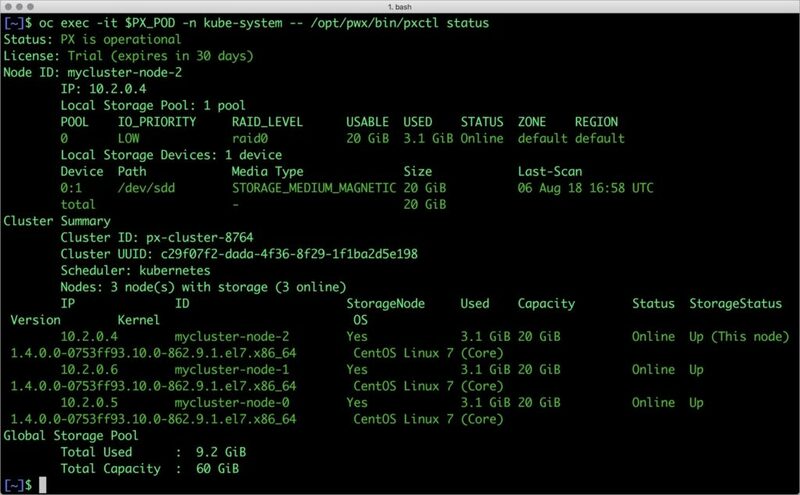 This tutorial is a walk-through of the steps involved in deploying, managing, and backing up a highly available MySQL database on OpenShift. 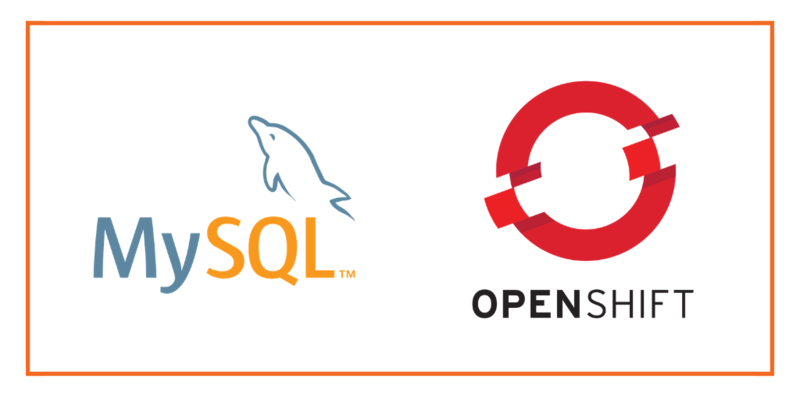 Once OpenShift Origin cluster is up and running and Portworx is installed and configured, we will deploy a highly available MySQL database. Now, let’s simulate node failure by cordoning off the OpenShift node on which MySQL is running. Now, let’s go ahead and delete the mysqlDB pod. Portworx supports creating snapshots for OpenShift PVCs. Notice that the collection is still there with the data intact. The above steps involved creating a local snapshot and using it to restore our MySQL database. This is useful for testing upgrades or feature branches, but is not typically what you would do to create a real backup of your application. For that, we will use Portworx Cloudsnaps, which work just like the snapshots we saw above, except that they will be pushed to Azure Blob Storage for safekeeping until they are needed. Then, we can simply pull the Kubernetes PV down into our environment, and redeploy our pods using the backed up persistent volume. 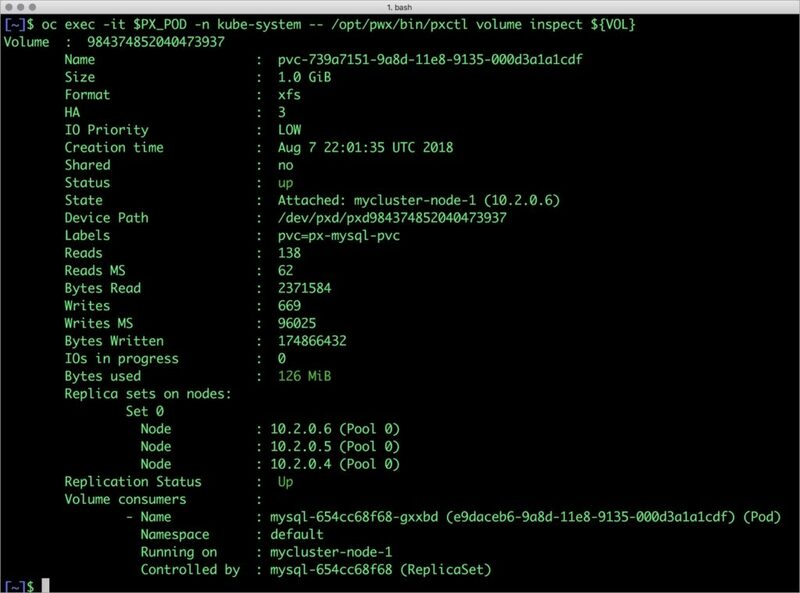 We’ll use kubectl to take a snapshot of our MySQL volume, and push it Azure Blob Storage. We will do these commands manually in this blog but in practice, you would automate this process using the Portworx SDK. This allows you to backup your database on an hourly basis, for example. The first backup uploaded to the cloud is a full backup. After that, subsequent backups are incremental. After 6 incremental backups, every 7th backup is a full backup. We will need to authenticate to Azure in order post our PV volume snapshot. For this, we will use pxctl credentials create command. These cloud credentials are stored in an external secret store. Before you use the command to create credentials, ensure that you have configured a secret provider of your choice. Here is a summary of available options. The pxctl credentials create enables the user to configure the credentials for each supported cloud provider. An additional encryption key can also be provided for each credential. If provided, all the data being backed up to the cloud will be encrypted using this key. The same key needs to be provided when configuring the credentials for restore to be able to decrypt the data successfully. Now, we will use pxctl credentials list to verify the credentials supplied. pxctl credentials list only displays non-secret values of the credentials. Secrets are neither stored locally nor displayed. These credentials will be stored as part of the secret endpoint given for PX for persisting authentication across reboots. Now that we have our credentials created, we are ready to backup our Kubernetes persistent volume to the cloud. First we will create a cloud snapshot for a PVC called mysql-data backed by a Portworx volume. The creation of the volumesnapshotdatas object indicates that the snapshot has been created. If you describe the volumesnapshotdatas object you can see the Portworx Cloud Snapshot ID and the PVC for which the snapshot was created. You may have noticed that we didn’t reference the credentials that we created in a previous step. That is because they were automatically applied by Portworx. If you had multiple sets of credentials, say for Azure and AWS object stores, you would use the cloud-cred-id option in the snapshot spec. portworx/cloud-cred-id: (Optional) This specifies the credentials UUID if you have configured credentials for multiple cloud providers. In a situation where a single cloud provider is configured, this is not required. As we saw before, since snapshots are just like volumes, we can use it to start a new instance of MySQL, except this time, instead of using a local snapshot, we will use our restored cloud snapshot. Let’s create a new instance of MySQL by restoring the snapshot data. Portworx can be easily deployed on Red Hat OpenShift to run stateful workloads in production, including mission-critical data management functions like backup and restore. Through the integration of Portworx and OpenShift, DevOps and DataOps teams can seamlessly run highly available database clusters in OpenShift. They can perform traditional operations such as volume expansion, snapshots, backup and recovery for the cloud-native applications.